Ray Kirk received his Mastersmith rating in the American Bladesmith Society in 2005. He has been making and designing knives since 1989. His favorite now is the integral that is forged from a round bar. He met a knife maker in 1994 that taught knife making at a local Vo-Tech who became his mentor and was his first contact with other makers since he started. Harry Fentress taught Ray how to hollow grind and valid heat treating principles. This greatly improved his knives performance. In 1995 he learned of the knife making properties of ball bearing steel, 52100. He has been forging knives from this steel ever since and has won many ABS cutting contests with it. Ray designed the CRKT K.E.R.T., a key ring multi tool that was designed primarily as a seat belt cutter for emergencies. Other functions were added and it will continue to be improved as time goes on. 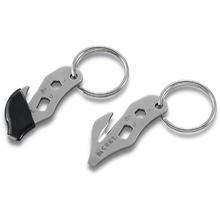 It is a very simple tool that utilizes the key ring as an integral part of the tool. This enables the tool to be small and readily available for use when you need it most.